Petroglyph Games have been making the most of their founding members’ RTS pedigree, following up their work on Command & Conquer with strategy titles ranging from Star Wars: Empire at War to Grey Goo. Their latest has a novel hook that lets you build your own units and factions, and it’s available now via Steam Early Access. Looking for more strategic action? These are the best strategy games on PC. 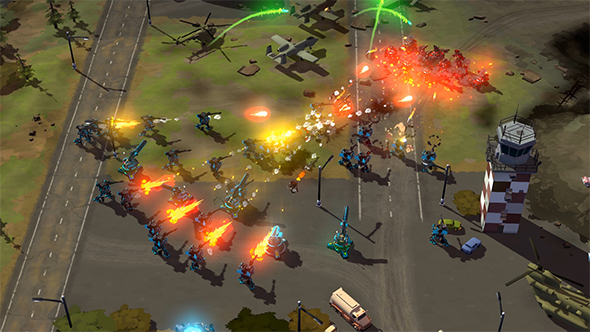 Forged Battalion has you building your army and tech tree across skirmish maps, campaign, and multiplayer battles. You can modify every unit from infantry to land vehicles and aircraft with a variety of weapons, movement types, and other additions. That might mean adding in some regenerative armor, or sticking anti-tank weapons on an aircraft. Resources gained in battle let you unlock new tech tree items between missions, opening new blueprint options so you can build your faction how you like. The Early Access version of the game features five campaign missions – the first part of a multi-act story – ten skirmish maps supporting multiple game modes, and eight-player online battles on dedicated servers. Petroglyph anticipate a six month stay in Early Access, during with the game getting a full-length campaign and “extensive multiplayer options” in addition to whatever comes as a result of community feedback. If you want to get in on the custom RTS action, Forged Battalion is available for $16.99 / £13.16 / €16.99 on Steam, which includes a 15% launch week discount. The game will be getting a price hike when it leaves Early Access, so bear that in mind.